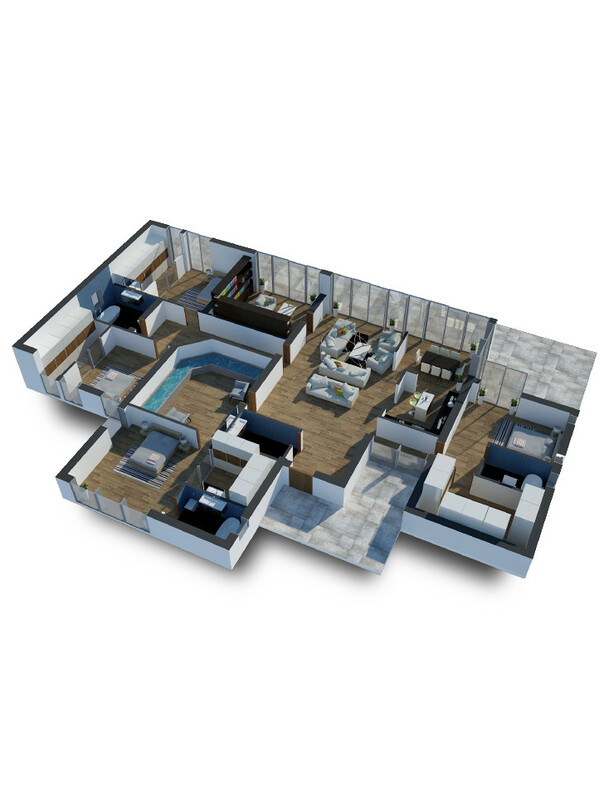 Have grandiose plans for your interior, but not the room to house them? 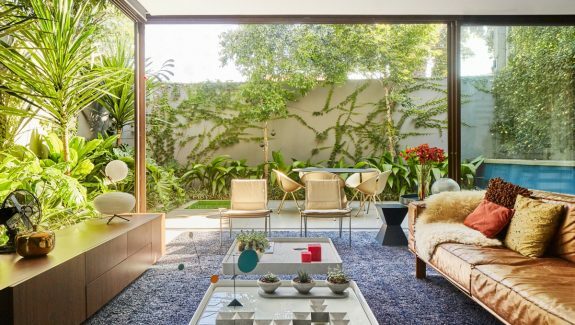 Never fear – interior inspiration for your small space is here. 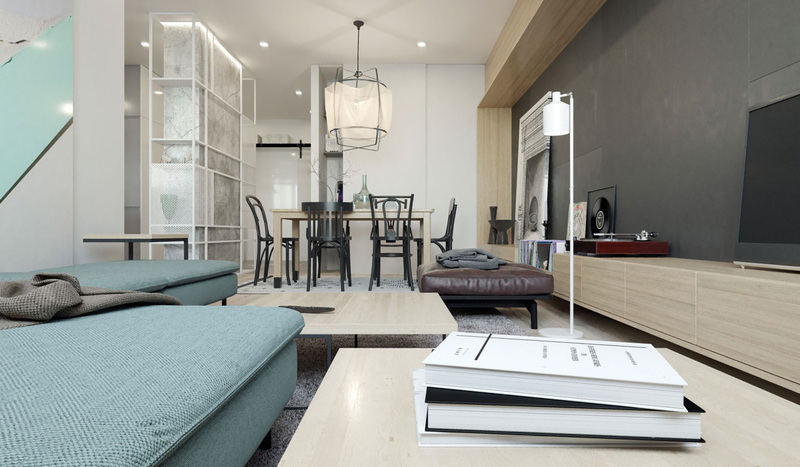 These two apartment designs, both under 60sqm, bring style to what could be boxy and boring. 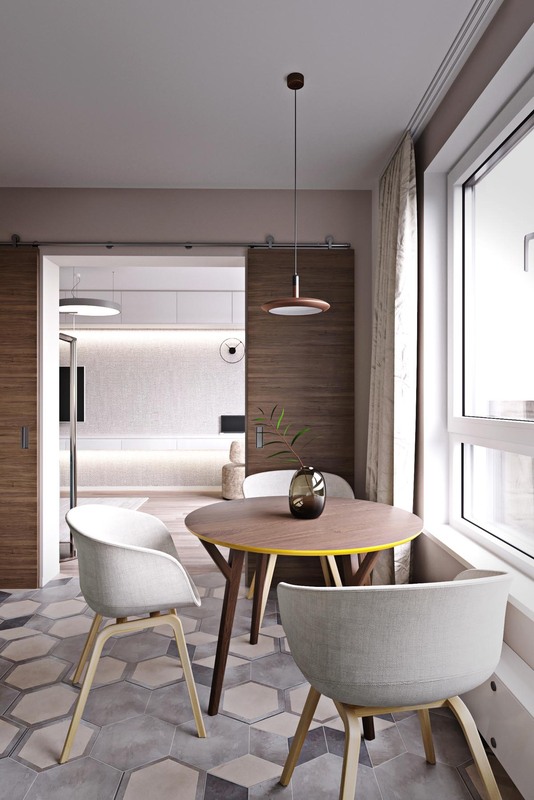 Using design motifs – such as hexagonal tiles, stencils and bold colouring – across multiple spaces, the rooms flow seamlessly, while keeping their own character. 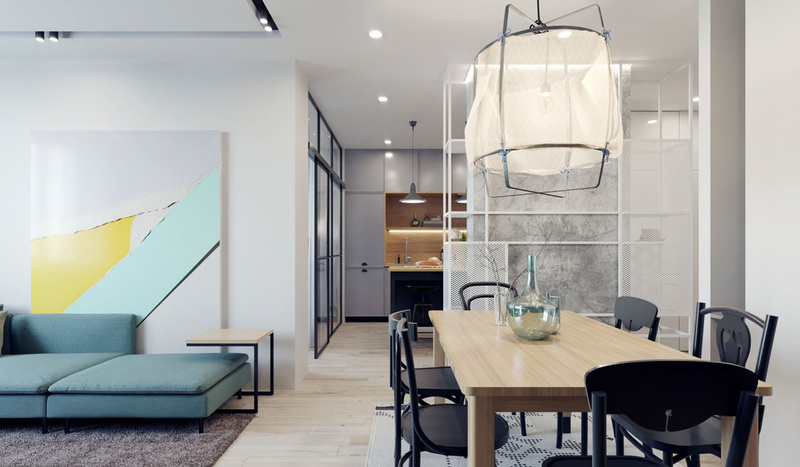 Open plans house kitchens, living and dining rooms, separating off spaces with jellyfish lamps, Japanese bookcases and opaque glass sliding doors. 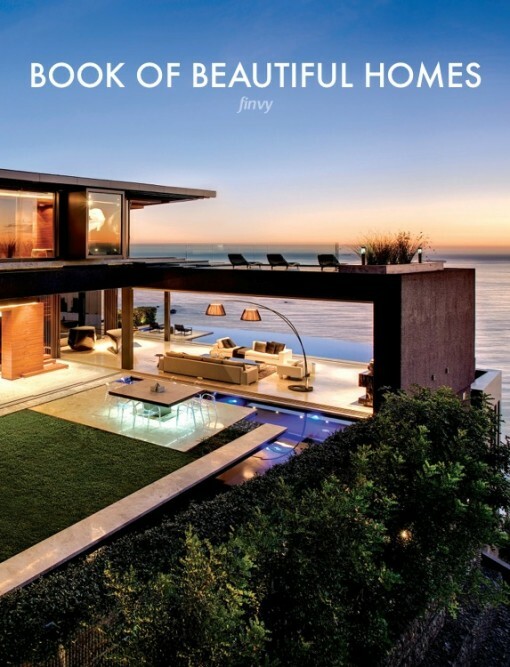 See the potential for your home or rental – in pictures and floor plans – with our house tours below. 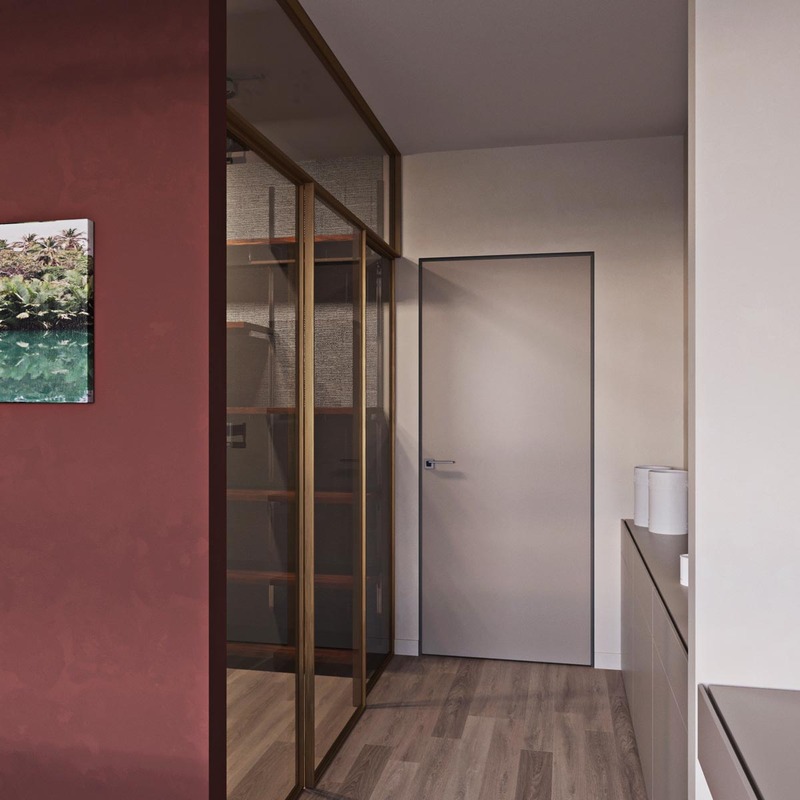 Our first small apartment is brought to life with bold accent colouring. 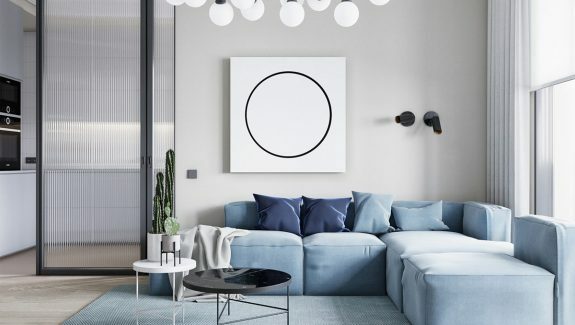 Using colour cues in teal and terracotta, rooms speak in their own language, while more muted creams and beiges keep the background noise down. 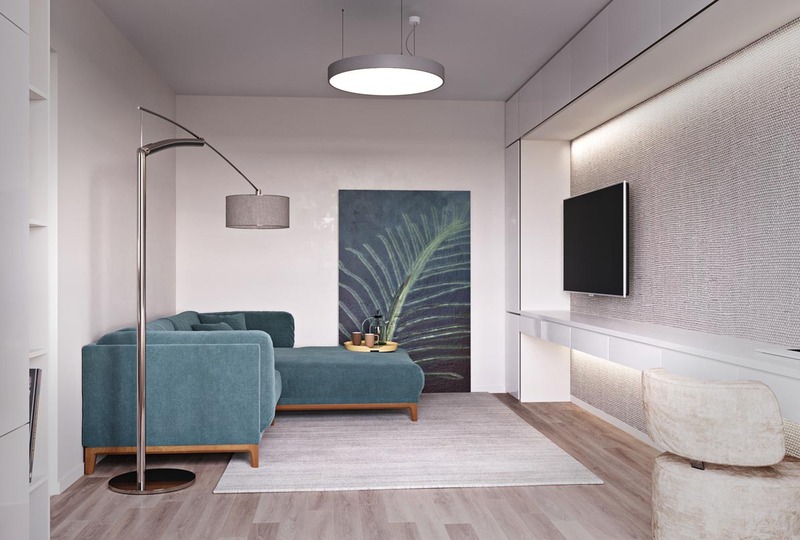 In the lounge, a chrome-polished and stone-upholstered unique floor lamp lights up a teal L-couch snuggling into the corner. Complemented by a leaning fern canvas, the space winds round to a linen TV enclave, an earthy material continuing the natural theme. 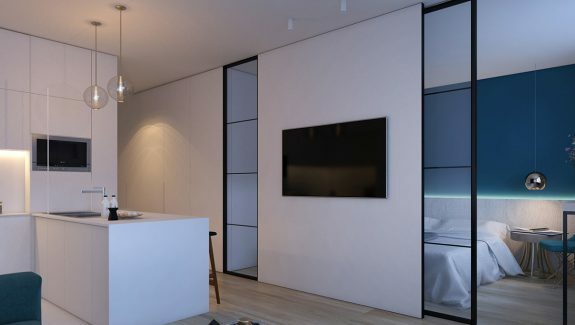 As the wall extends, a working space reveals itself beside the most minimalist of unique table lamps, the IKEA Work Lamp, which lightly glows over the linen. Minor details in stencilled unique wall clocks, suede ottomans and a woven stone mat reinforce softer background palettes, while a mini tea-set complete with glass pitcher offers a view through chiffon. 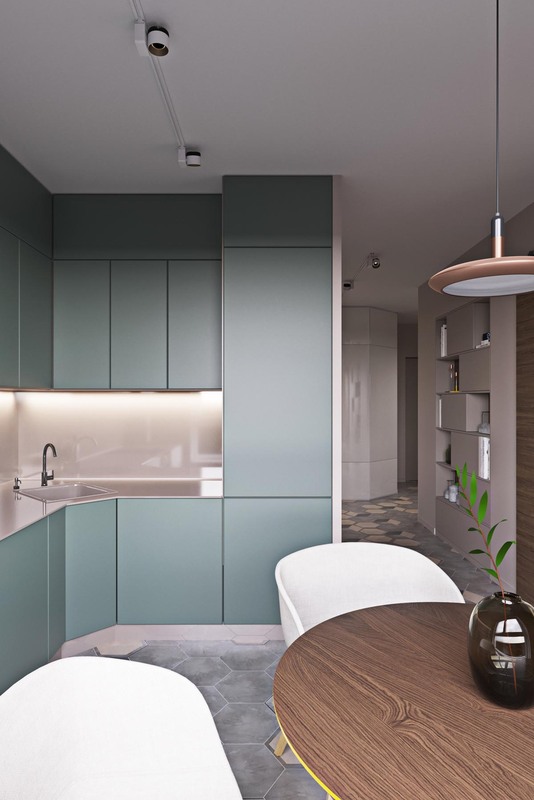 Carrying on the teal theme, the kitchen marks the spot for eating with complementary wooden dining room pendant lights. Extending over a wall, table, and chair legs, wood provides a neutral surface from which to showcase the beehive-tiled floor, a 70’s dream in alternating shades of stone and cream. Tying in with the floor, three modern dining chairs from About A Chair clad their sitters in stone, while a darkened-glass vase offers a segue between light and dark. A solo vased sprig, bright-yellow table edging and LED lighting add the finishing touches. Hexagonal tiling provides a distinctive feature that doesn’t soak up space. 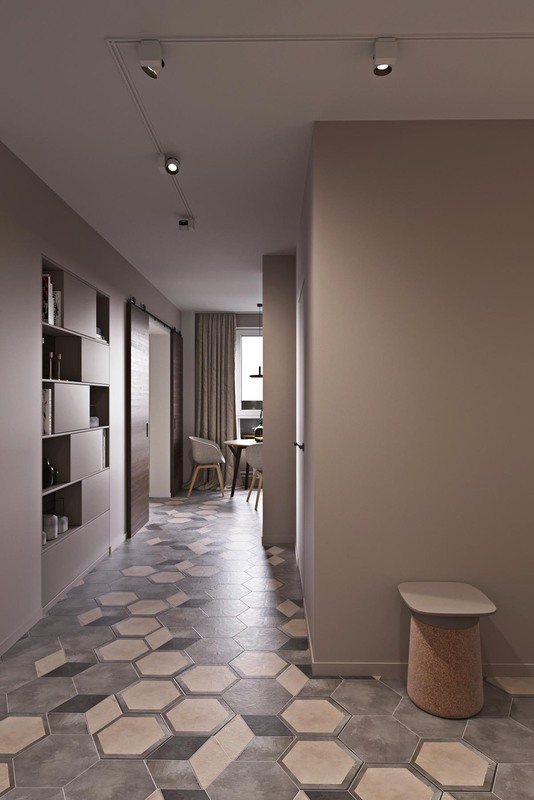 Winding through the kitchen and down the hallway, its mottled shapes play with a modern bookcase, which opens and shuts down the sides of the walls. Opening up near the entrance to offer a coat rack, the corridor’s design affords enough room for a sitting cork stool. 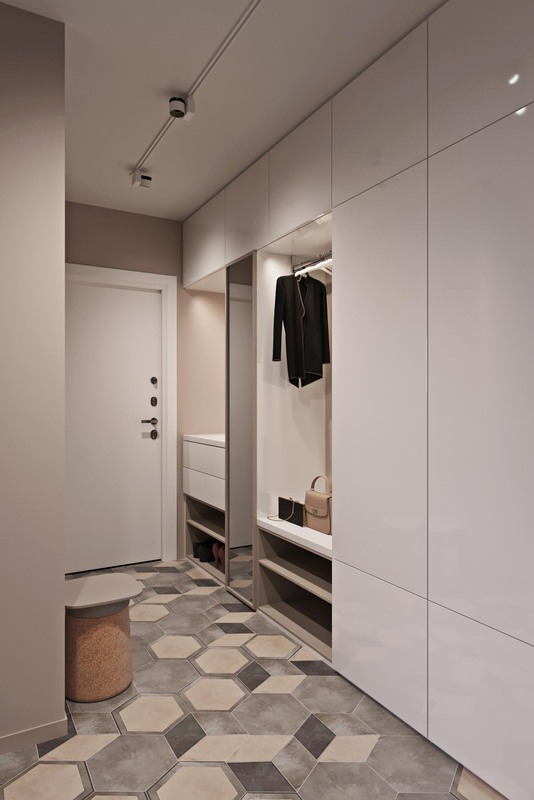 A simple panel mirror makes the space seem wider, as stray shoes tuck under the shelving. Another closet beckons in our master bedroom. Faced by a smaller mirror, cream cabinetry and lightly-patterned candle holders, its stone walls and wooden floors are kept secret by reflective glass doors, maintaining privacy. Black and wooden boxes on five rows of shelving offer a great place to hide unsightly storage. 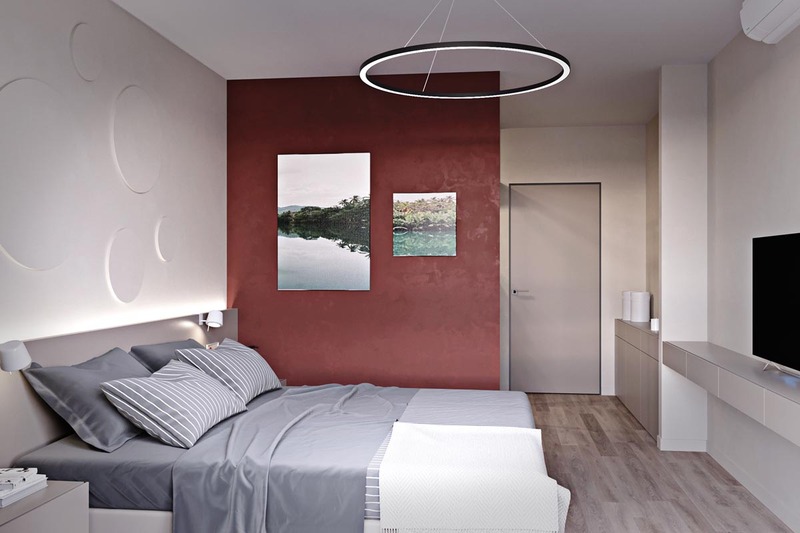 The bedroom reveals another feature colour – terracotta red. Staking out a full wall, its two canvases provide the room with colour, referenced by a small portrait on the bedside ledge. 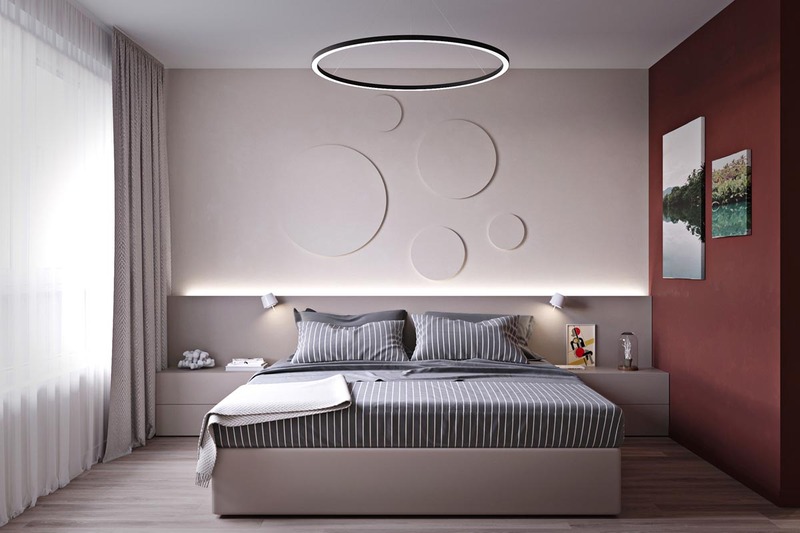 Lit by two small modern wall sconces, the ledge lifts up to engraved-look circular decals and a ring light pendant. 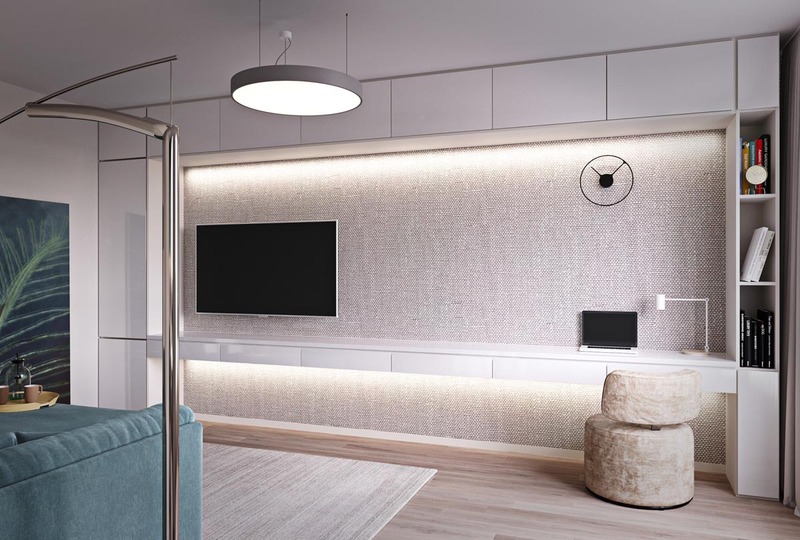 Marking out the centre, the pendant segues the mirroring TV ledge, grey-and-white bedding and wall motifs. 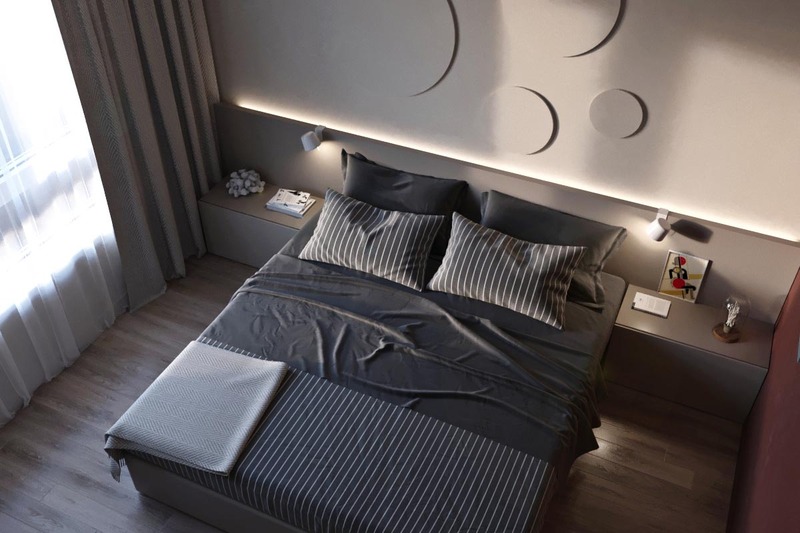 Beige wooden flooring, full-height curtains and stone-hued ledges soften the mood for sleeping. 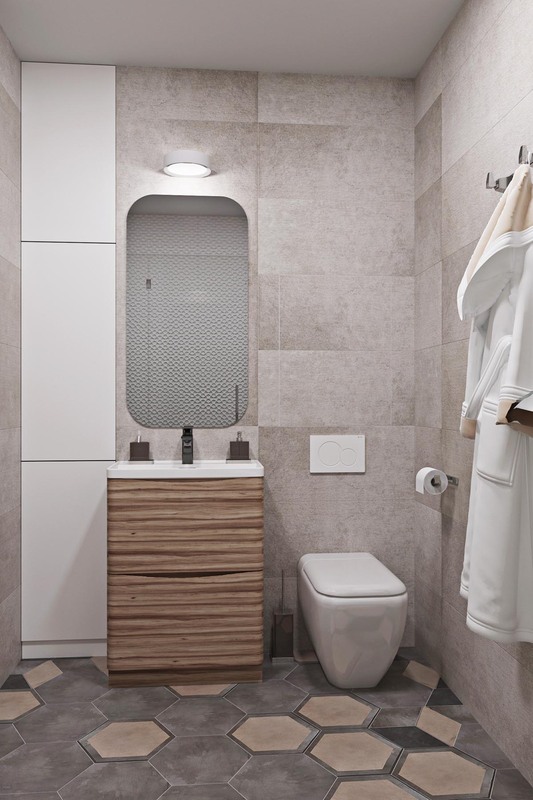 Reminiscent of the kitchen’s 70’s feel, the ensuite makes the hippy modern. A rounded rectangular mirror, boxed wooden stand and hexagonal tiles create an design typical of the era. 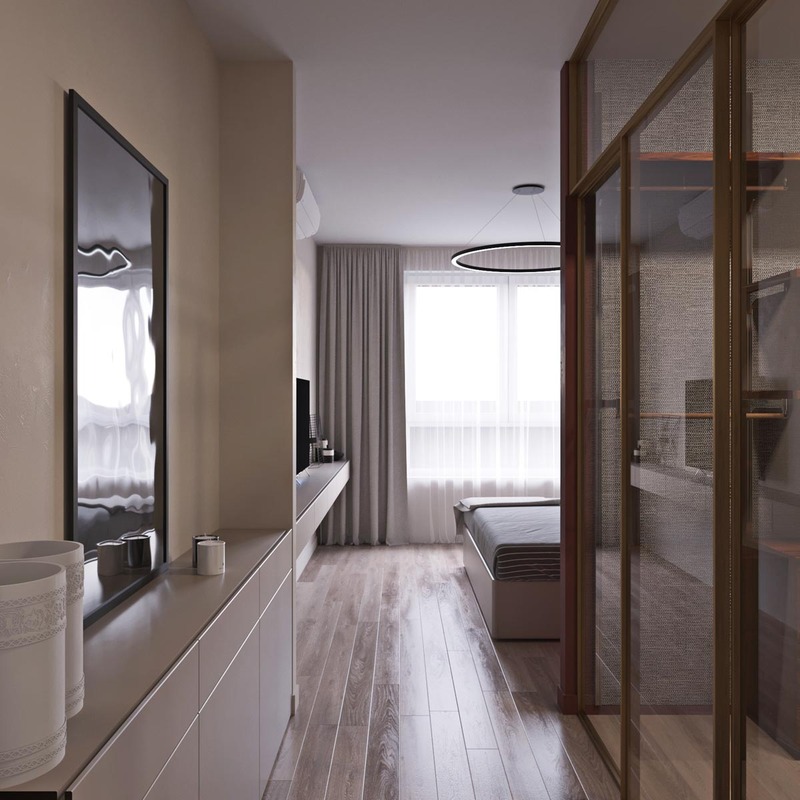 Mixed with more modern features in black-boxed soap and lotion dispensers, a teardrop toilet, chrome wall hooks and a full glass shower, the space appears fresh and distinctive. 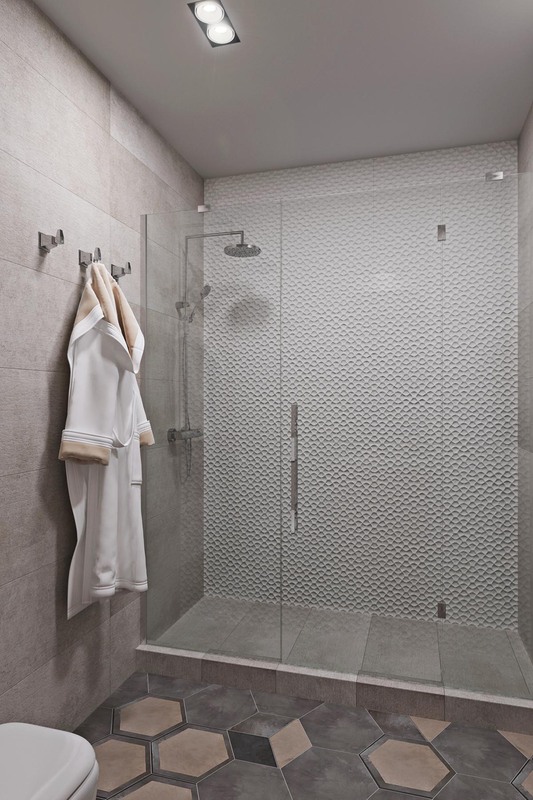 A textured shower wall adds a surprising twist. 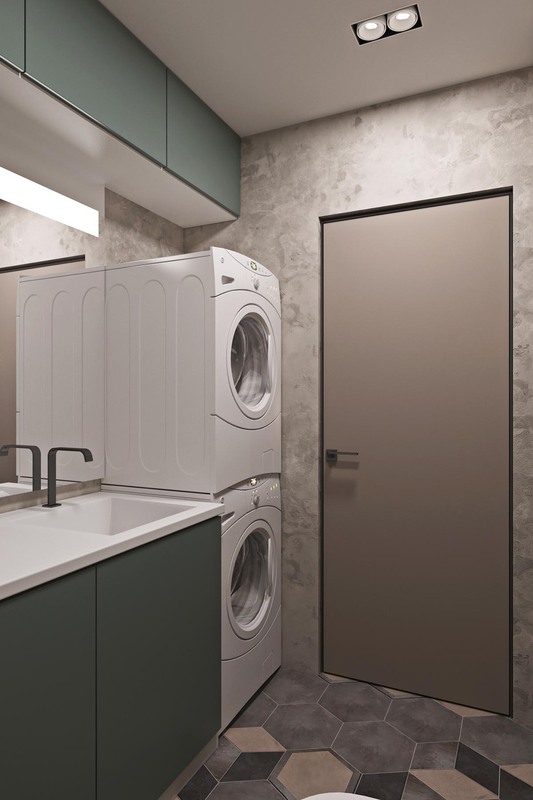 Opening again to textured walls, the shared laundry and toilet tie in more interior themes. 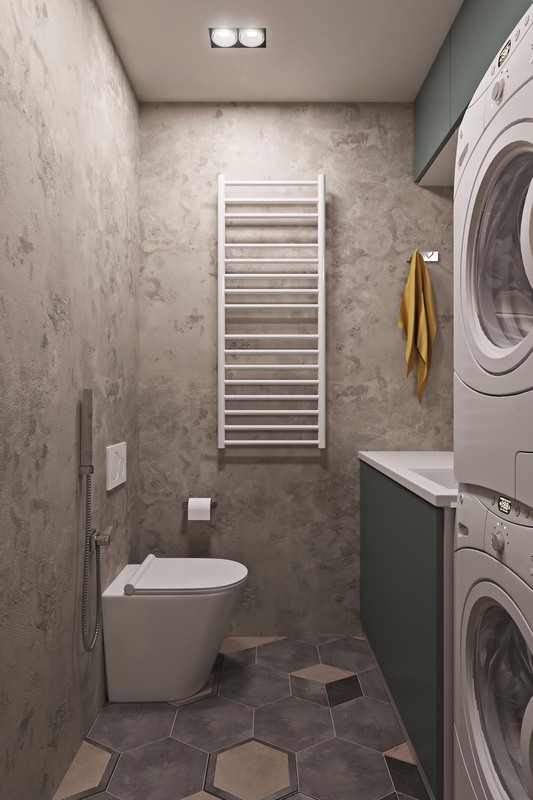 Using the teal from the lounge and tiles from the kitchen, its economical benches store a bathroom sink, washer and dryer, and LED-lit mirror. A bold black tap from the ensuite and chrome shower head make it easy to clean. 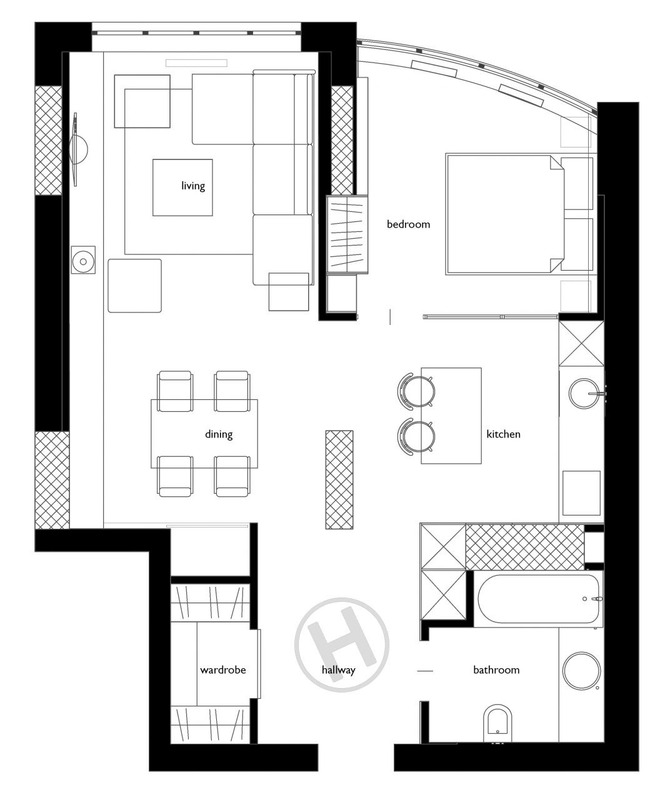 Take a look at our floor plan for the bigger picture. 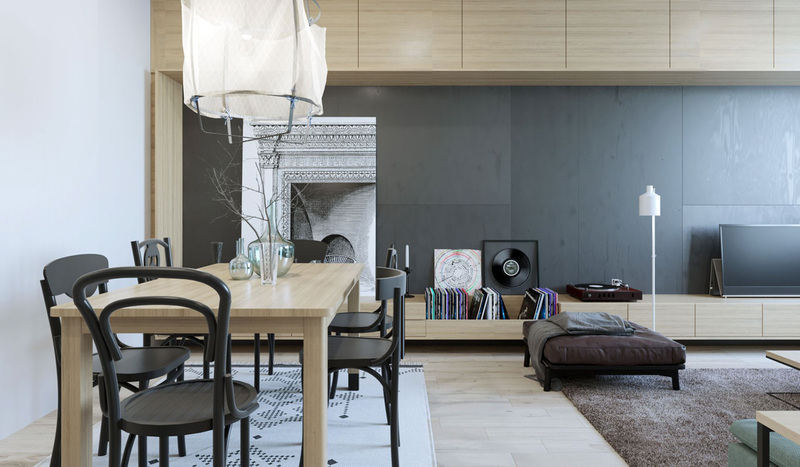 Sitting at an even smaller 55sqm, our second apartment in Kiev, Ukraine is inspired by being unique. 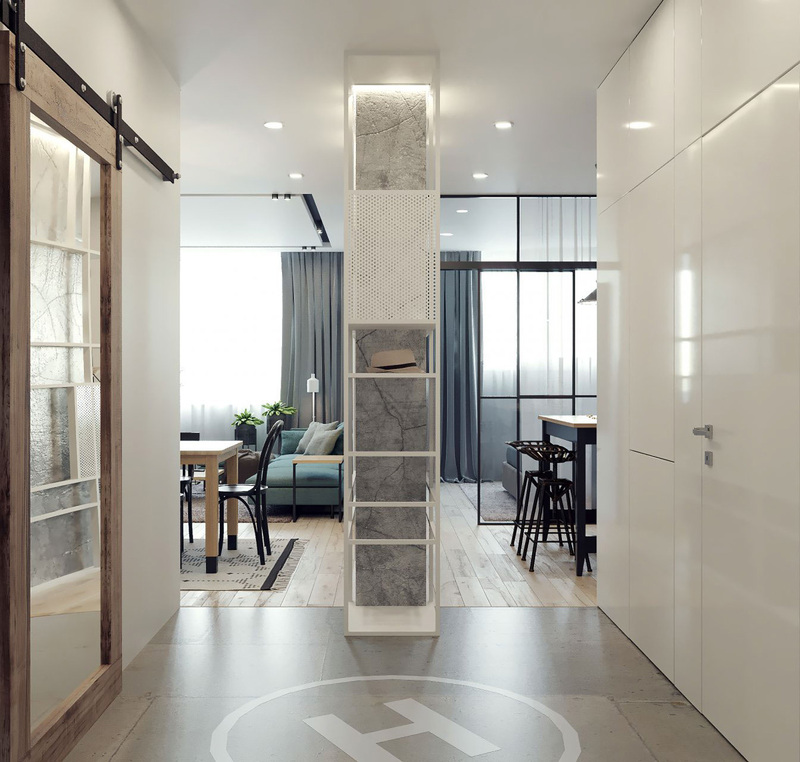 Lifting off from a helicopter pad floor decal, the interior first presents us with a room-dividing plinth. 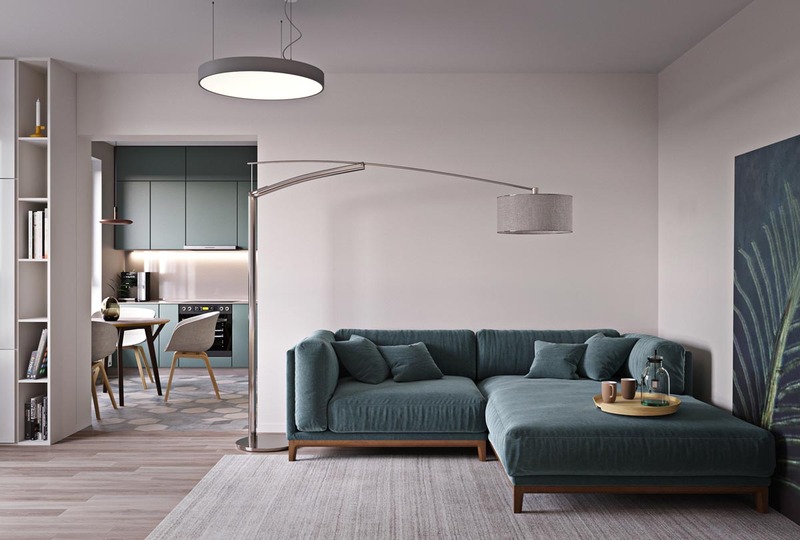 Choosing the open-plan dining, lounge and chill area from the two, thick black stencil lines in the dining room chairs, ottoman and coffee table legs lead the way to a pastel green couch. 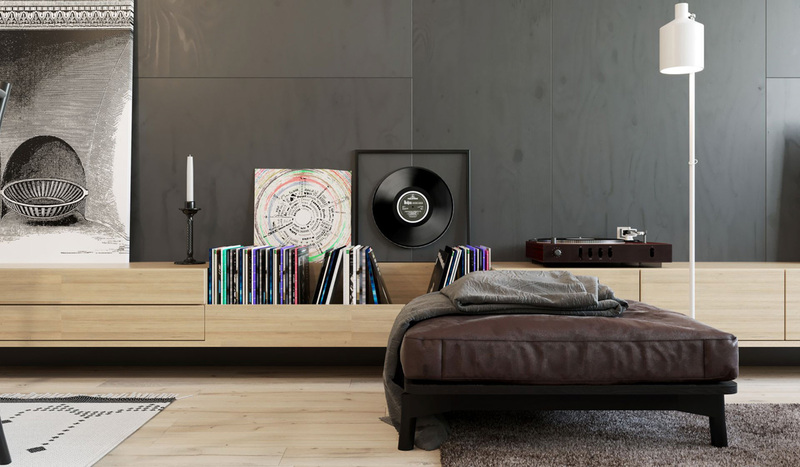 Providing a relaxation area for music-themed home decor fans, a range of vinyls deck the wooden ledges lining the room, while a suede chaise longue offers a seat to enjoy them. 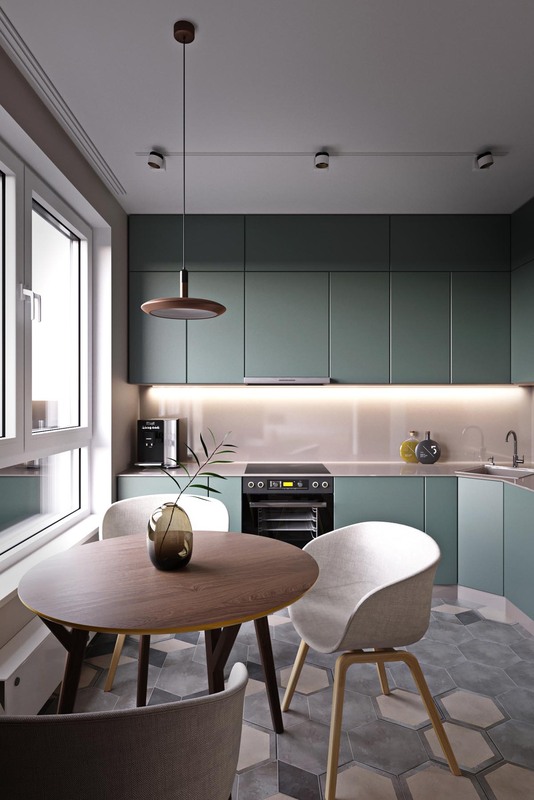 Looking from the ottoman, the space opens out to a kitchen in grey, a neutral-tone dining area and splashes of colour in an above-sofa artwork. Lit by the most unique of dining room pendant lights, a linen jellyfish hovers above the dining area, an eclectic collection of black-framed chairs and glass centrepieces. 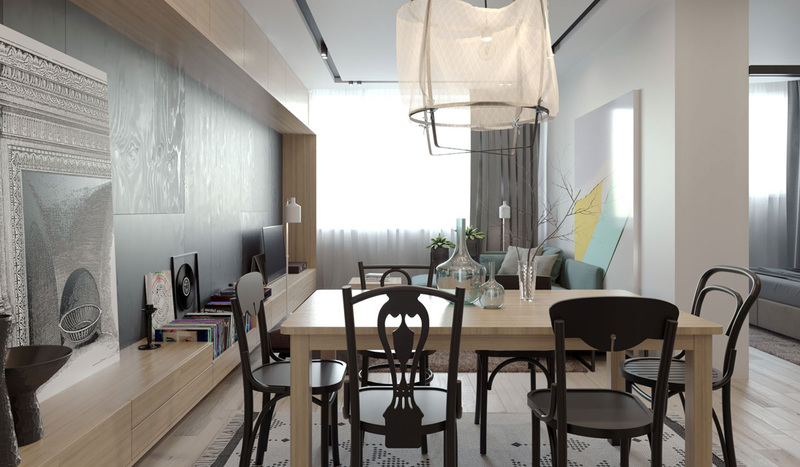 Each bringing a different style, the six chairs offer six unique personalities beside the table’s matching black feet. A beautiful antique fireplace brings warmth, the mottled grey bookcase a sly peek at dinner. 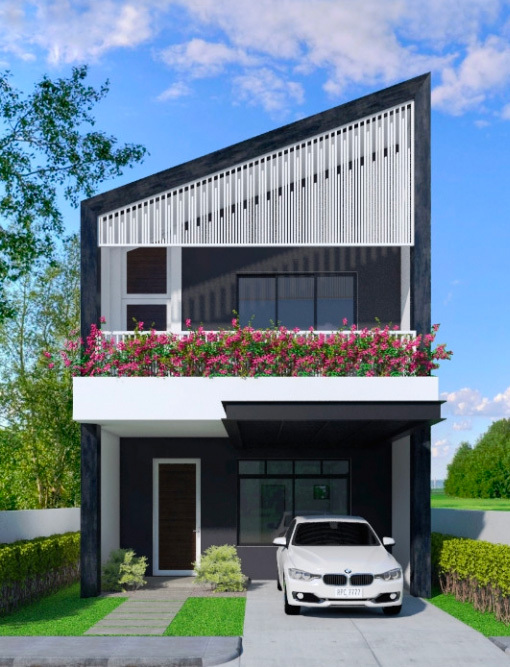 Decorative vases in tulip and bell-pepper shapes are referenced by black ceramics on the ledge, while a grey and black mat ties the shades in. 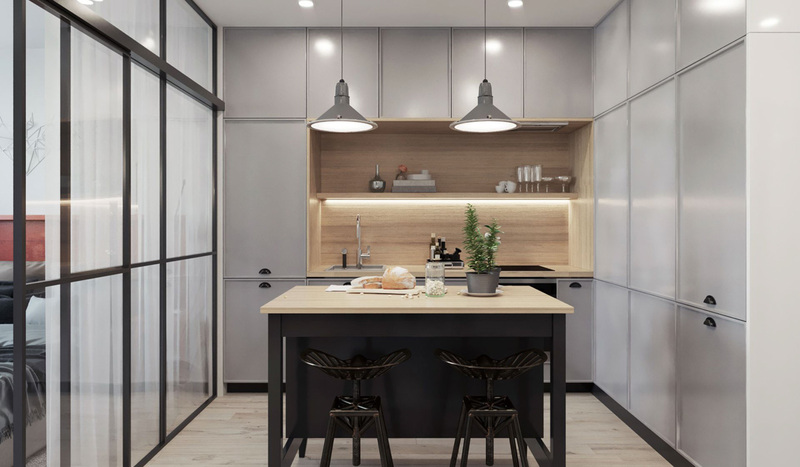 The kitchen breathes in similar tones to the dining room, using light wood and thick black motifs. 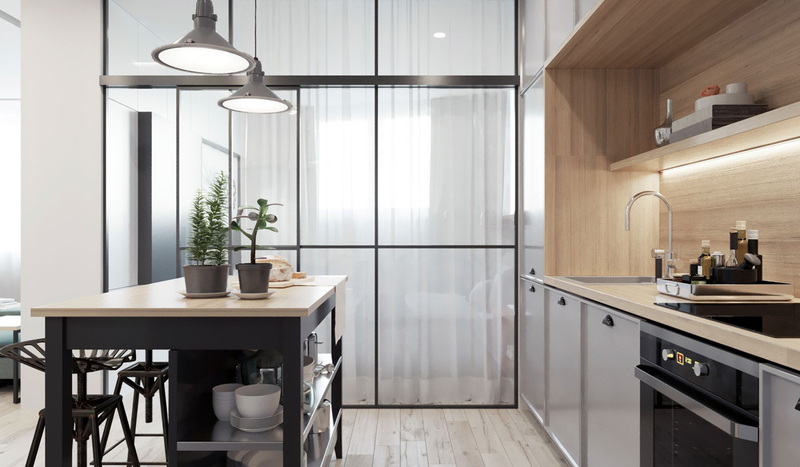 Bordered by a white and grey bookcase and Japanese stencil windows, it retains a light and airy feel separate from adjoining spaces. Fringed kitchen bar stools offer a seat to view its LED-lit wooden panels, which sit tight within opaque grey cabinetry. 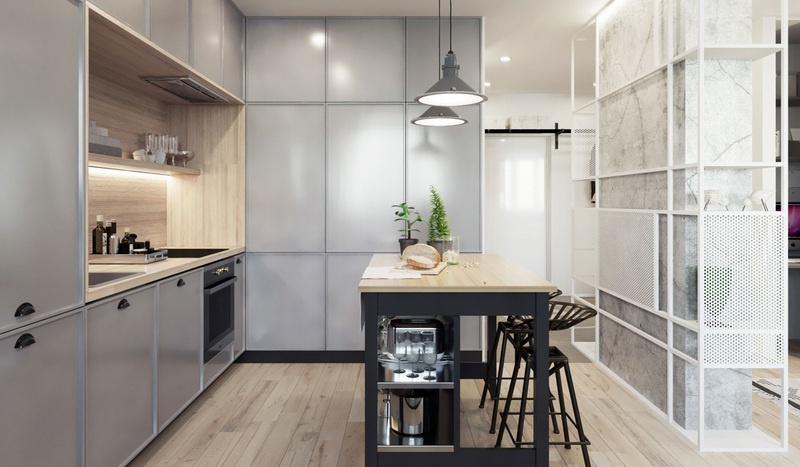 Showcasing cups, wine glasses and the odd martini triangle, its open shelves display the best, while the necessities hide in closed cabinets and under-table shelving. 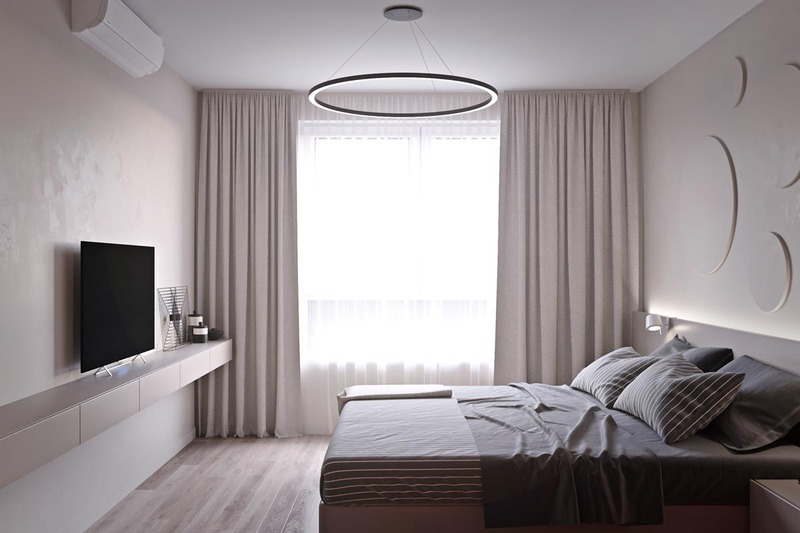 A couple of unique kitchen pendant lights in the same hue illuminate unique planters, while a wisp of chiffon blocks the view of the bedroom. 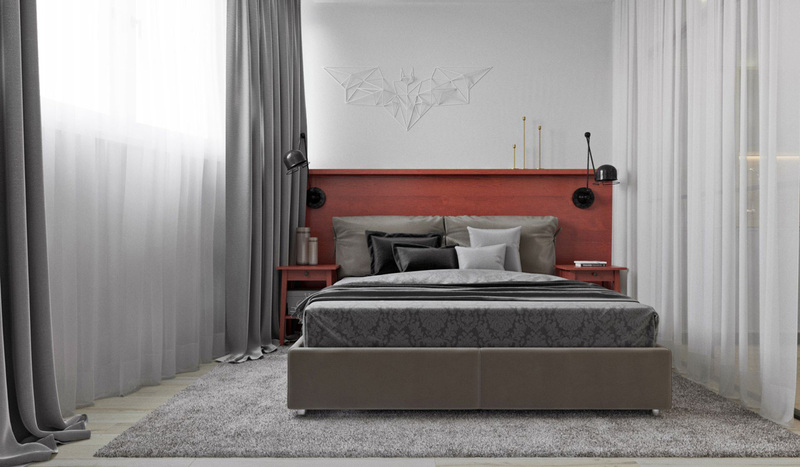 Headed by lacquered wood and a geometric stencil, the bed appears bold amidst its grey and white surroundings. Aided by a couple of black wall sconces, its Florentine-patterned bedspread is the perfect accessory for blending a grey woollen mat and black and white stencil print. 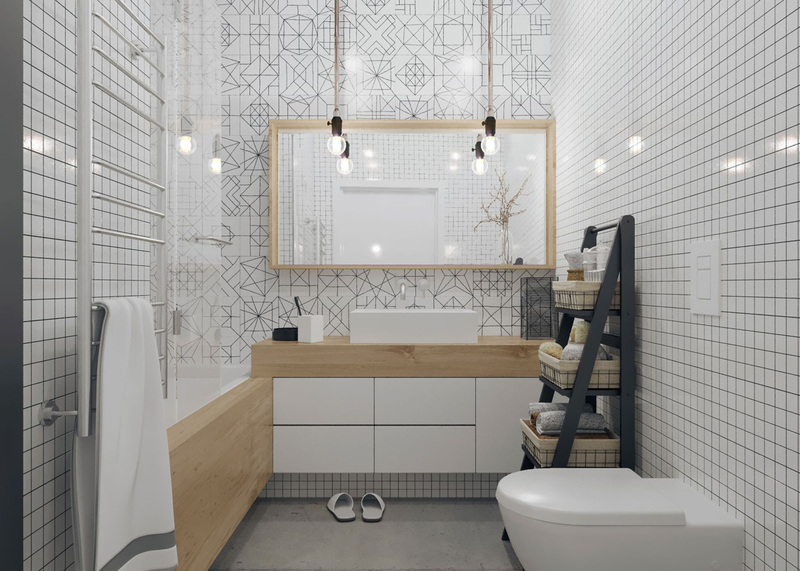 The bathroom is the perfect synergy of all the spaces. Carrying the bedroom’s stencilling and dining room’s dark framing, its black-edged tiles look effortlessly stylish and unique. 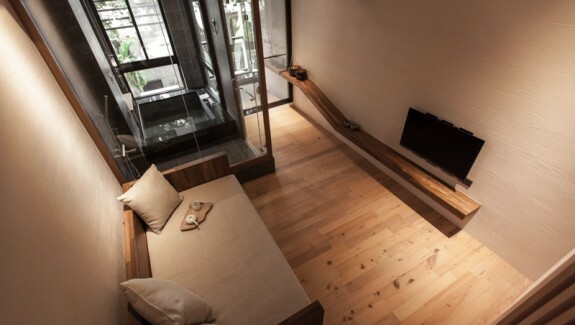 Light-wooden tones form thick panels around a bathtub, kitchen sink and mirror. 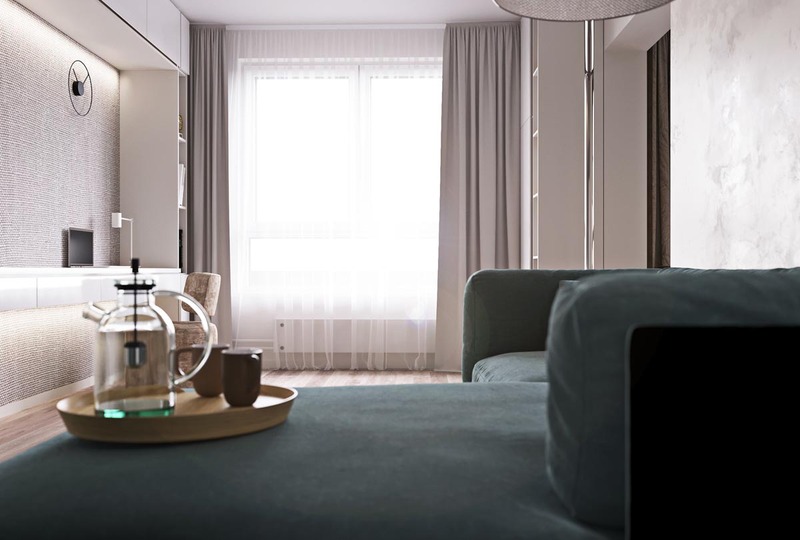 A few idea bulbs dangle from the ceiling, a reminder of the apartment’s clever space-saving ideas. 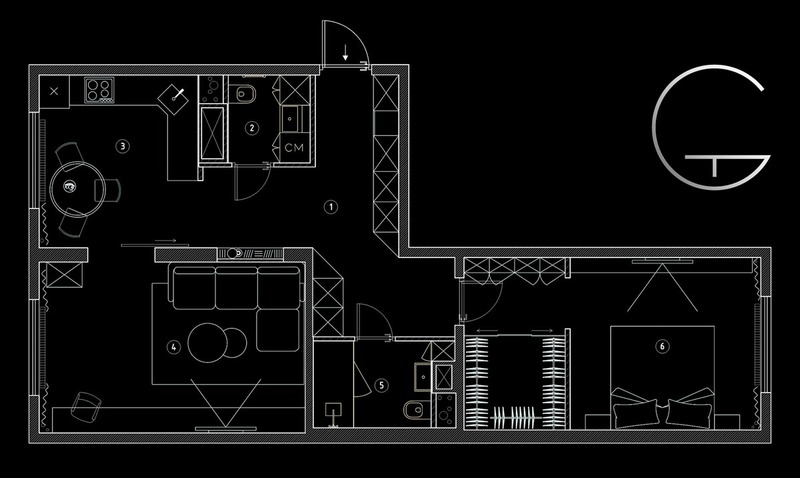 Take a look at the floor plan, for a bird’s eye view.